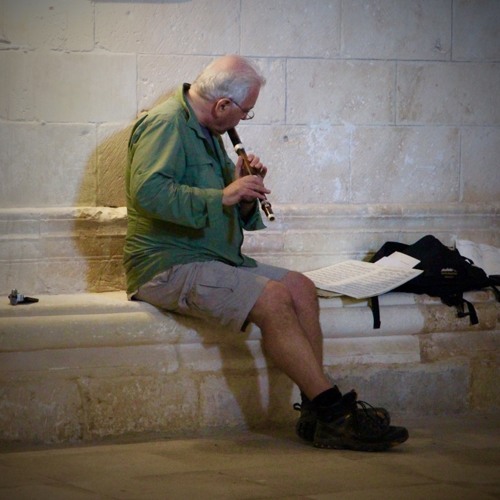 Recorded on 7 June 2015 while walking the Camino de Santiago. Place: the church of San Juan de Ortega (near Burgos). Flute: copy of J.H. Rottenburgh c.1740 -- Pitch: A=c.400Hz Recording equipment: iPhone 6 with Zoom iQ7 stereo mics (on the bench behind me in the photo) Greg Dikmans (flute): "I walked 12.4 kms in the morning and was the first of my group to reach San Juan. I ate my lunch quickly so I could get some time in the church before we had to head off again." "I had about 15 minutes of almost complete silence. After that people started talking and making noises in the background. The following pieces are the first few I played in the order I played them. There was no time for thought or preparation - just put the flute together and play. I'm very happy with the results. It was a joy to play in that space."